I’ve noted in my blogs over the past two weeks that I’ve received positive indications from my Bear-o-meter for a lower risk stock environment– with the only remaining signal needed as a move by the S&P 500 (SPX) over its 200 day (40 week) SMA. I’ve noted in the past, as I did on the Bloomberg/BNN show last week, that I like to see 3 positive days (preferably clustered within a single week) before confirming the probability of a market turnaround. We got that signal last week. So, as when I posted the Bear-o-meter reading, the only component for an outright buy signal – based on the way I do things- is a firm move over the 200 day SMA by the SPX. Of note, that moving average currently sits a hair over 2760. The market sits a hair over 2720 as I write this blog. We are talking really, really close here, folks. The only other monkey in the barrel that remains is the mid-term election – which takes place tomorrow. It is expected that markets will react positively if the Republicans win both legislatures vs. if the Democrats win. However, presidential election stock market cycles demonstrate that no matter who wins, the pattern is often bullish for markets after the results (positive or negative) are absorbed. Don Vialoux notes on his popular “timing the markets blog” that strong employment figures may help the Republicans maintain control of the senate. We shall see. Note the chart below – if you look at the mid-termed part (second year) of the 4 year electoral cycle, you will see that markets tend to be flat to bearish over much of the year (which they have been) – and then see a reprieve in about the last two months of the year. That, along with a setup for a very strong year into the third year of the 4 year cycle, also known as the post-election year. 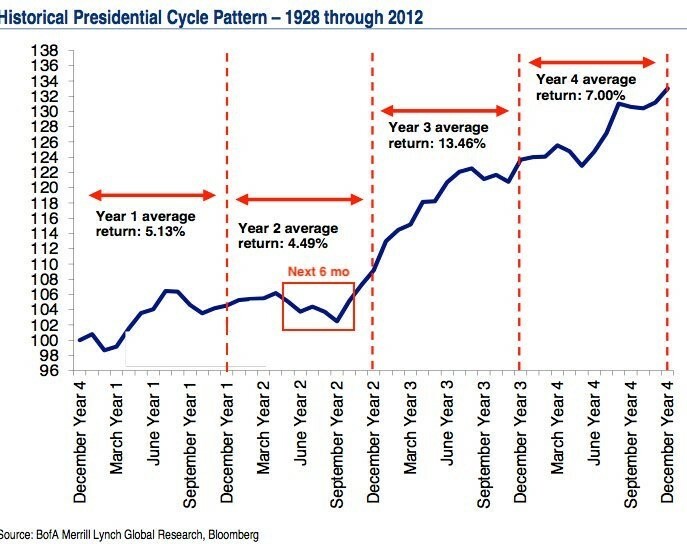 Should the cycle follow (and it has followed its past tendencies throughout the Trump presidency), next year may be a fantastic year on the markets. We shall see. I expect this week to begin moving into the market with the cash we at ValueTrend held over this summer. If the market sells off tomorrow, that would be icing on the cake—possibly a good opportunity made better to buy stocks. If it rises, I will play it by ear and either buy in if it’s not too aggressive a rally – or wait a day or so. Either way, I will not deploy the entirety of our cash reserves until the S&P takes out 2760. I expect to go in with about half of my cash to start. Should that move over the 200 day average occur this week, it is really up to the market’s “look” as to whether I give it a few days to prove an adherence to that level, or just jump right in. Sharp moves tend to make me hold back a bit (given the market’s tendency to sell off emotional moves one way or another) – vs. orderly moves into the market. Either way, I expect to be into the market this week with a potential for holding back some cash if the 200 day SMA is not cracked. Its all about controlling our emotions, and following a plan. As always, what I am doing is not necessarily the way you should play it. You may feel that this market should be bought now without abandon. That, or you may want to hold off entirely until the 200 day SMA is broken and holds for a number of days. I am not going to argue with either strategy. The point is, having a strategy beats an emotional approach to investing. And that, folks, is what this blog is all about. Happy trading! Always enjoy your opinions and strategies. For what it is worth, I am now fully in the market as of last week. A bit early, with some but seasonality, US election tendencies, US GDP all seem too good to wait on this year so we do what we think is best and watch. It is a quibble, but I use the 200EMA – exponential moving average, rather than SMA, simple moving average. AS of today, Tuesday November 6th, The 200EMA is 2754.20 and $SPX closed at 2755.45, so just a hair above it. I still see lots of resistance from this level all the way up to the 50EMA, which is currently at 2795.73 and declining. Then the next level of resistance is 2816.94, which was the high in mid-October before the market “plunged”. I recently bought some XSU and XMC on the TSX. Good luck to all. I do agree that exponential MA’s are “superior” in concept and construction..yet, i still insist on using a simple 200 day MA. Am I missing something here? Well, my premise is that Technical Analysis is the study of crowd behavior. Most of the crowd watches the SMA, not the EMA. Thus, despite the benefits of weighting that the EMA offers, I am aware that other traders are likely to fixate on the SMA. So, being a crowd behavior analyst (which is why I also use sentiment extensively..the ultimate crowd behavior tool)–I like to look at what the majority of the crowd is watching. I know that every time I hear a TA or even a PM who largely uses fundamentals refer to a moving average, they pay attention to the 200 day SMA. Not the EMA. Thus, I follow it because they do–because I know they will react to its signals. And knowing how the crowd may react is part of the game. Yes, that makes sense. BUT the way I look at it is that the EMA gives an edge due to how it is constructed. And I can use that edge. Thanks for this discussion. The S&P 500 is flirting with you (as of today, it is over the 40 week MA but the three days up has failed). At what point do you start paying more attention to the actual stocks (or ETFs) you intend to buy than to the market as a whole, i.e. the indexes. The S&P 500 is still over its 200 day SMA. It broke 2760 (200 day SMA point) on Wednesday. I am writing this on Thursday–so if it remains over 2760 by Tuesday next week we have the verification of that rule. As far as individual stocks, we bought stocks with one half (10%) of our cash allocation the day before the mid-term election date (Tuesday)–which has turned out to be a good move so far. We picked stocks based on their own merit – the original signal was a market signal I noted in my past blog (Bearometer back to neutral, then 3 days up). We will spend the other half of our cash next week, assuming an adherence above the 200 day SMA. We will again pick the stocks based on their own merit–but the market is the macro signal that offers some comfort that we are buying at a safer time. With today’s large pullback (Fri), I’ve internalized your 3-day rule. I also noticed that you played the trade by going 1/2 in and a hair early for maximum gain. Thanks for sharing. It helps going through this example with you. Thanks Sally–yes, as people might notice, I use this blog to muse outloud—its a bit of a diary. i feel that if i make a good move–people can see the strategy worked. If I make a move and it fails, I will examine it and people can see how the strategy can fail, how a loss prevention system can minimize the pain, and perhaps we can all examine how to better a similar trade in the future. We are dealing in probability, not absolutes. Thus, we will experience bad trades – only in a world of absolutes (such as mathematics or science) can we make repeatable wins every time.